Journal of the House of Lords: Volume 63, 1830-1831. Originally published by His Majesty's Stationery Office, London, [n.d.]. Die Jovis, 9° Decembris 1830. Mac Neill v. Mac Neill & Jollie. Langston et al. v. Langston et al. Respondents Petition to lodge their Case, referred to Appeal Com ee. Dr. Williamson et al. v. Thomson. Highgate & Whetstone Road Bill. Message to H.C. that the Lords have agreed to it. Education, (Ireland,) Petition from Kiliconduff & Meelick for regulating Grants for. Waste Lands, Petition from Middlesex & Surrey for Grant of, for Employment of the Poor. Distress of the Country, Motiou respecting, Negatived. Ordered and Adjudged, by the Lords Spiritual and Temporal in Parliament assembled, That the said Petition and Appeal be, and is hereby dismissed this House, and that the Interlocutor therein complained of, be, and the same is hereby Affirmed. It is Ordered and Adjudged, by the Lords Spiritual and Temporal in Parliament assembled, That the said Petition and Appeal be, and is hereby dismissed this House, and that the Interlocutors therein complained of, be, and the same are hereby Affirmed. Ordered, That the Cause wherein Malcolm Mac Neill Esquire is Appellant, and Mrs. Mary Black Mac Neill, and Robert Jollie her Husband, are Respondents, be heard by Counsel at the Bar To-morrow. Ordered, That the Cause wherein James Galbraith and John Galbraith are Appellants, and Richard Galbraith Esquire is Respondent, be heard by Counsel at the Bar To-morrow. Upon reading the Petition of James Galbraith and John Galbraith, Appellants in a Cause depending in this House, to which Richard Galbraith Esquire is Respondent; praying, "That their Lordships will be pleased to put off the Hearing of this Cause 'till the 16th Day of December instant:"
It is Ordered, That the said Petition do lie on the Table. Upon reading the Petition of James Haughton Langston, and others, Respondents in a Cause depending in this House, to which Julia Langston, and others, are Appellants; praying, "That their Lordships will be pleased to grant them Leave now to lodge their Case:"
It is Ordered, That the said Petition be referred to the Committee appointed to consider of the Causes in which Prints of the Appellants and Respondents Cases, now depending in this House in Matters of Appeals and Writs of Error, have not been delivered; pursuant to the Standing Orders of this House. "Earl of Stamford and Warrington. Then it was moved, "That the Clause in the said Act, directing that the Names of such Persons who shall appear to hold or to have held any of the Offices or Employments therein specified shall be struck out of the said List, be now read." The same was accordingly read by the Clerk. Ordered, That the said Titles be referred to the same Committee, to report the Names of those who shall appear to hold or to have held any of the Offices or Employments specified in the said Act. Their Lordships, or any Five of them, to meet Tomorrow, at the usual Time and Place; and to adjourn as they please. Ordered, That the said Committee do appoint their own Chairman. The House being moved, "That a Day may be appointed for hearing the Cross Appeal wherein Doctor James Williamson, and others, are Appellants, and James Thomson Esquire is Respondent:"
It is Ordered, That this House will hear the said Cause, by Counsel at the Bar, at the same Time with the Original Appeal, wherein James Thomson Esquire is Appellant, and Doctor James Williamson, and others, are Respondents. 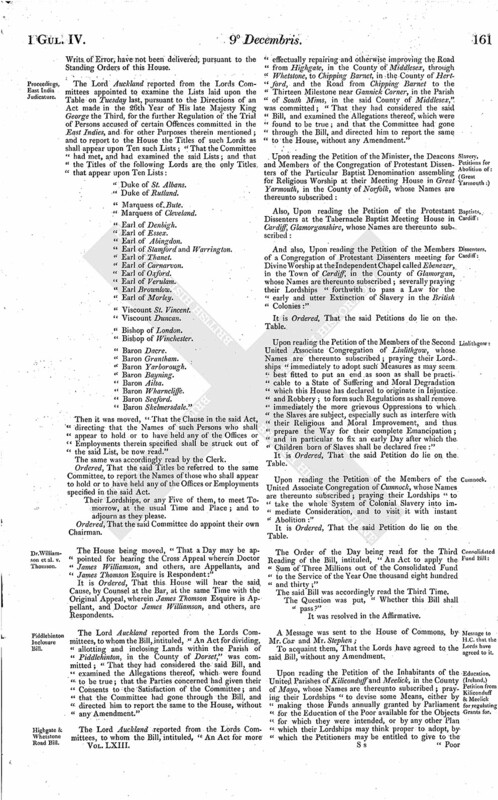 The Lord Auckland reported from the Lords Committees, to whom the Bill, intituled, "An Act for dividing, allotting and inclosing Lands within the Parish of Piddlehinton, in the County of Dorset," was committed; "That they had considered the said Bill, and examined the Allegations thereof, which were found to be true; that the Parties concerned had given their Consents to the Satisfaction of the Committee; and that the Committee had gone through the Bill, and directed him to report the same to the House, without any Amendment." The Lord Auckland reported from the Lords Committees, to whom the Bill, intituled, "An Act for more effectually repairing and otherwise improving the Road from Highgate, in the County of Middlesex, through Whetstone, to Chipping Barnet, in the County of Hertford, and the Road from Chipping Barnet to the Thirteen Milestone near Gannick Corner, in the Parish of South Mims, in the said County of Middlesex," was committed; "That they had considered the said Bill, and examined the Allegations thereof, which were found to be true; and that the Committee had gone through the Bill, and directed him to report the same to the House, without any Amendment." 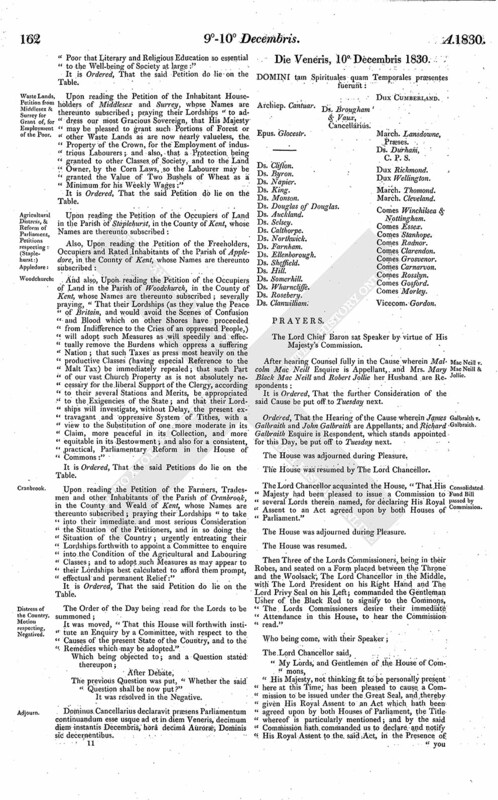 And also, Upon reading the Petition of the Members of a Congregation of Protestant Dissenters meeting for Divine Worship at the Independent Chapel called Ebenezer, in the Town of Cardiff, in the County of Glamorgan, whose Names are thereunto subscribed; severally praying their Lordships "forthwith to pass a Law for the early and utter Extinction of Slavery in the British Colonies:"
It is Ordered, That the said Petitions do lie on the Table. 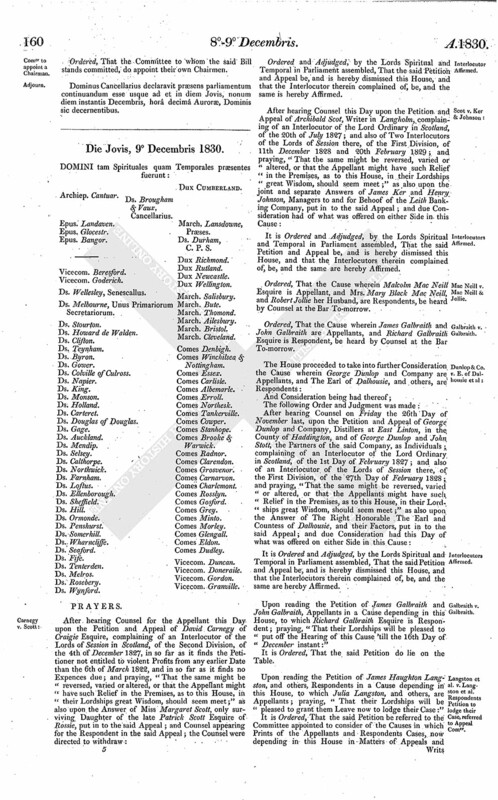 Upon reading the Petition of the Members of the Second United Associate Congregation of Linlithgow, whose Names are thereunto subscribed; praying their Lordships "immediately to adopt such Measures as may seem best fitted to put an end as soon as shall be practicable to a State of Suffering and Moral Degradation which this House has declared to originate in Injustice and Robbery; to form such Regulations as shall remove immediately the more grievous Oppressions to which the Slaves are subject, especially such as interfere with their Religious and Moral Improvement, and thus prepare the Way for their complete Emancipation; and in particular to fix an early Day after which the Children born of Slaves shall be declared free:"
Upon reading the Petition of the Members of the United Associate Congregation of Cumnock, whose Names are thereunto subscribed; praying their Lordships "to take the whole System of Colonial Slavery into immediate Consideration, and to visit it with instant Abolition:"
The Order of the Day being read for the Third Reading of the Bill, intituled, "An Act to apply the Sum of Three Millions out of the Consolidated Fund to the Service of the Year One thousand eight hundred and thirty;"
The said Bill was accordingly read the Third Time. The Question was put, "Whether this Bill shall pass?" It was resolved in the Affirmative. To acquaint them, That the Lords have agreed to the said Bill, without any Amendment. Upon reading the Petition of the Inhabitants of the United Parishes of Kiliconduff and Meelick, in the County of Mayo, whose Names are thereunto subscribed; praying their Lordships "to devise some Means, either by making those Funds annually granted by Parliament for the Education of the Poor available for the Objects for which they were intended, or by any other Plan which their Lordships may think proper to adopt, by which the Petitioners may be entitled to give to the Poor that Literary and Religious Education so essential to the Well-being of Society at large:"
Upon reading the Petition of the Inhabitant Householders of Middlesex and Surrey, whose Names are thereunto subscribed; praying their Lordships "to address our most Gracious Sovereign, that His Majesty may be pleased to grant such Portions of Forest or other Waste Lands as are now nearly valueless, the Property of the Crown, for the Employment of industrious Labourers; and also, that a Protection being granted to other Classes of Society, and to the Land Owner, by the Corn Laws, so the Labourer may be granted the Value of Two Bushels of Wheat as a Minimum for his Weekly Wages:"
And also, Upon reading the Petition of the Occupiers of Land in the Parish of Woodchurch, in the County of Kent, whose Names are thereunto subscribed; severally praying, "That their Lordships (as they value the Peace of Britain, and would avoid the Scenes of Confusion and Blood which on other Shores have proceeded from Indifference to the Cries of an oppressed People,) will adopt such Measures as will speedily and effectually remove the Burdens which oppress a suffering Nation; that such Taxes as press most heavily on the productive Classes (having especial Reference to the Malt Tax) be immediately repealed; that such Part of our vast Church Property as is not absolutely necessary for the liberal Support of the Clergy, according to their several Stations and Merits, be appropriated to the Exigencies of the State; and that their Lordships will investigate, without Delay, the present extravagant and oppressive System of Tithes, with a view to the Substitution of one more moderate in its Claim, more peaceful in its Collection, and more equitable in its Bestowment; and also for a consistent, practical, Parliamentary Reform in the House of Commons:"
Upon reading the Petition of the Farmers, Tradesmen and other Inhabitants of the Parish of Cranbrook, in the County and Weald of Kent, whose Names are thereunto subscribed; praying their Lordships "to take into their immediate and most serious Consideration the Situation of the Petitioners, and in so doing the Situation of the Country; urgently entreating their Lordships forthwith to appoint a Committee to enquire into the Condition of the Agricultural and Labouring Classes; and to adopt such Measures as may appear to their Lordships best calculated to afford them prompt, effectual and permanent Relief:"
It was moved, "That this House will forthwith institute an Enquiry by a Committee, with respect to the Causes of the present State of the Country, and to the Remedies which may be adopted." The previous Question was put, "Whether the said Question shall be now put?" It was resolved in the Negative. Dominus Cancellarius declaravit præsens Parliamentum continuandum esse usque ad et in diem Veneris, decimum diem instantis Decembris, horâ decimâ Auroræ, Dominis sic decernentibus.